Zombies or unicorns, that is the question. Holly Black and Justine Larbalestier had a debate on which creature was better. Holly is on Team Unicorn along with Kathleen Duey, Meg Cabot, Garth Nix, Margo Lanagan, Naomi Novik, and Diana Peterfreund. Team Zombie consists of Justine Larbalestier, Libba Bray, Alaya Dawn Johnson, Cassandra Clare, Maureen Johnson, Scott Westerfeld, and Carrie Ryan. Holly Black and Justine Larbalestier have witty banter before every short story dissing on the other team. My favorite unicorn story was Princess Prettypants written by Meg Cabot. It was about a 16 year old girl who got a unicorn for her birthday instead of her dream car. Her friend gets in trouble at a party and she rides her mythical beast to the party to rescue her friend. 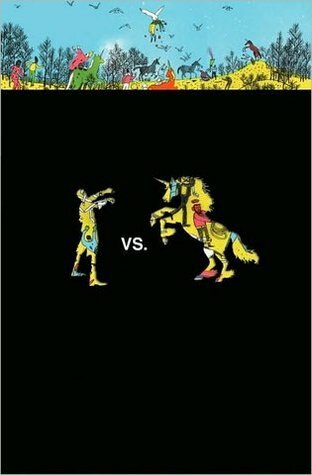 This story was really funny, but I didn’t like many of the unicorn stories, but I did love most of the zombie stories. My favotire zombie story was Bougainvillea written by Carrie Ryan. This story was about a young girl who lived on an island in a castle with her dad. They saw pirates, or mudo all the time, but stayed away from them when they were on the island. The mudo turned out to be the zombies of this story. This is the story that stuck with me the most. Overall I’m very glad that I got to read this; I read this with some of my friends for book club. We voted on which stories we liked the best and I am definitely Team Zombie. I really enjoyed this book, and being able to talk about it with my friends. This book was an anthology, so there were a bunch of short stories. They alternated between zombie and unicorn stories. Every story had different characters, but my favorite character out of any of the stories was Belcazar the unicorn from the story Purity Test. He was very sassy and enjoyed making the girl in his story irritated. Most of the characters were fun to read about, though. I think that I would choose to be the sassy unicorn, Belcazar, from Purity Test. He was really funny, and obviously very sassy. And his name was Belcazar, and what’s cooler than that?